The Acan Lord is a regal stand alone! ...being the only critter named 'Lord' in the aquatic animal world! The Acan Lord Acanthastrea lordhowensis, also known as 'The Lord', is the most colorful of the Acanthastrea genus. They come in most color combinations from red, purple, green, orange, blue, rust, brown and pale gray, to pale tan. Some descriptive names the A. lordhowensis are known by include Acan Lord Howe, Closed Brain Coral, Pineapple Starry Cup Coral, Pineapple Brain Coral, Lordhowensis, and Brain Coral. The A. lordhowensis has been propagated in captivity with great success, leading to a variety of colors. Some names used by reef farmers are Watermelon Aussie Lord, Blood Diamond Aussie Lord, Green Acan Lord, and so forth. This is one of the two most popular and sought after of the Acanthastrea species, with the second being the Acan Echinata A. echinata, or Starry cup Coral. The Acan Lord Howe is a great coral and is very easy to care for. They are not at all demanding and they will readily grow new polyps. They do not need to be fed since they use the dissolved organics in the tank for nourishment. Try to avoid housing with soft corals as they do not do as well in their presence, and some will die if the softy population is too high. Provide a low water movement, and do not use Metal Halides since the Acan Lord will not fully open. The Acanthastrea species are fairly common in nature and have been regularly available in the aquarium trade for many years. They are collected in similar numbers as other Mussidae corals including the well known Lobophyllia and Blastomussa species. However, Acanthastrea corals have often been misidentified. They are easily confused with some of these other members of the Mussidae family as well as species from the Faviidae family. Consequently Importers, retailers, and ultimately reef keepers often don't know what they have, so will simply trade them as 'brain corals'. Those that are advertised as Acanthastrea are generally quite pricey. This video has great pointers and care times for the Acan corals! Acans need to be fed quite often and with mysis and similarly sized foods. The video will show how to propagate and how to feed them. Soft corals can produce toxins that can inhibit and possibly kill your Acan, so use Poly Filter or Purigen to keep the chemical war to a minimum! Distribution / Background Acanthastrea Coral Information: The Acanthastrea genus was described by Edwards and Haime in 1848. There are about 16 species, approximately 13 of which are true species with 4 being found around Australia. Species include: A. amakusensis, A. bowerbanki, A. echinata, A. faviaformis, A. hemprichi, A. hemprichii, A. hillae, A. horrida, A. ishigakiensis, A. lordhowensis, A. maxima, A. minuta, A. regularis, A. rotundaflora, A. simplex, and A. subechinata. A. micromusa it is not actually in the Acanthastrea genus due to its skeletal structure and as of yet has not been added to the list. Some common names the Acanthastrea corals are know for are Brain Coral, Bullseye Coral, Moon coral, Pineapple Coral, Starry Cup Coral, Pineapple Starry Cup Coral, and Pineapple Brain Coral. The Acanthastrea genus has been propagated in captivity. The A. lordhowensis was described by Veron and Pichon in 1982. Some common names these corals are know for are Lord Acan, 'The Lord', Acan Lord Howe, Closed Brain Coral, Pineapple Starry Cup Coral, Pineapple Brain Coral, Lordhowensis, and Brain CoraL. The A. lordhowensis has been propagated in captivity with great success, leading to a variety of colors. Some names used by reef farmers are Watermelon Aussie Lord, Blood Diamond Aussie Lord, Green Acan Lord etc. Where Acanthastrea Corals Are Found: The Acanthastrea lordhowensis are found in Hong Kong, Philippines, and around Australia in the Flinders Reef, Elizabeth Reef, Middleton Reef, Lord Howe Island, Solitary Island, Dampier Archipelago, and the Burrup Peninsula. Acanthastrea Coral Habitat: The Acanthastrea lordhowensis live in a wide range of reefal habitats, and are found at depths of 0-98 feet (0 - 30 m). Some colonies can reach 9 feet (3 m) in diameter. They feed at night, extending thick tangled tentacles. Status The A. lordhowensis is not on the IUCN Red List of Endangered Species. Description What do Acanthastrea Corals look like: The A. lordhowensis has corallites (skeleton formation under each polyp) that have very uneven walls, height wise, so when all the polyps expand, the surface is not "level." The septa are thick and have large teeth with the skeletal structure in the center of each polyp not being as developed. They are the most colorful of all the genus and pretty come in most color combinations such as red, purple, green, orange,blue, rust, brown and pale gray to pale tan. When selecting your specimen of A. lordhowensis, it can be a little easier to identify if the fleshy polyps are out fully. This helps to avoid confusion with Favites, Favia, and Moseleya corals, as they have a deeper indent where their mouth is located. They can also be easily confused with Blastomussa and Lobophyllia species. Unlike these, the corallite walls of A. lordhowensis are not "separate" on its skeletal structure, rather all its corallite walls are shared between the individual polyps. The expanded polyps give the illusion of separate polyps with individual corallite walls, but don't let that fool you. Irritating the coral to the point of shrinking to observe the structure of the skeleton may be a only to identify some specimens. Some colonies of A. lordhowensis can reach 9 feet (3 m). Life span is unknown. Difficulty of Care Acanthastrea Coral Care: Like other Mussids, the A. lordhowensis is easy to care for, making them an excellent choice for the beginner. Provide a moderate light, as strong light will prevent the polyps from opening fully. Water flow should be low as well. Like other members of the Mussidae family, the polyps tentacles come out at night to feed. Foods / Feeding Acanthastrea Coral Feeding: The Acanthastrea genus, like other large polyp stony (LPS) corals, have developed several feeding strategies. Through a symbiotic relationship with a marine algae, known as zooxanthellae, they receive some of their nutrients. They also capture planktonic organisms, food particles from the water column, and can absorb dissolved organic matter. In captivity, A. echinata feed mostly on nanoplankton and dissolved organics in the water, though like Ricordea (a type of Mushroom Coral), they can be fed zooplankton and very small prey. The Acan Lord will not do as well in a "pristine" water environment with no fish, as fish provide a source of nitrogen that they need to thrive. Calcium nitrate is also appreciated. Note that this is different from just plain calcium that we all add to our tanks for our corals. Aquarium Parameters A well-feed live rock/reef environment is what is needed for your Acanthastrea Coral, along with some fish for organic matter production, and dissolved organics. A mature tank is recommended. Be sure to have proper water movement and lighting. Provide a low water flow and moderate lighting for the best health. Do not use metal halides since the Acan Lord will not fully open under lighting that is too strong. This is an aggressive species, extending their sweeper tentacles at night. There needs to be plenty of space between it and other corals. Compatibility and Social Behaviors The Acanthastrea genus is aggressive towards other corals. The A. lordhowensis will get along with their same species, but typically different colors of different species tend to be more aggressive. They do need to be kept well away from other corals. They have tentacles that come out at night and sting nearby corals. Also, if close enough they will invert their stomach onto a nearby coral and digest the tissue right out of the skeleton. Once their "enemy" has been digested, they retract their stomach back inside. The Acanthastrea genus does not do as well in the presence of soft corals. Some Acan species will die if the population of softies is too high. The Acanthastrea genus are hermaphrodites that use external fertilization in the wild, but this has so far not been duplicated in man made systems. This genus reproduce asexually as well. In captivity, the A. lordhowensis will drop tissue when stressed, in an attempt to propagate.They can also be propagated by fragmenting. Potential Problems The A. lordhowensis are attractive and durable when their needs are provided for. They are pretty hardy, but can starve to death in a nitrate free tank. 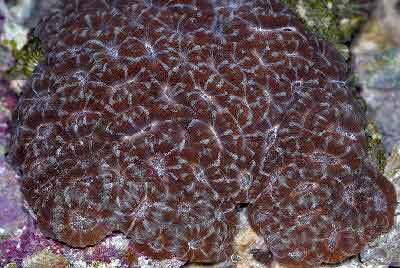 Availability Acanthastrea Corals for Sale: The A. lordhowensis is very easy to find at pet shops and on line. The cost online varies, depending on retailer, size, and/or color. One example would be $49.00 USD for a 2 to 3 polyps frag up to $149.00 USD for a 5/8" (10 cm) "rare" Acan Lord.